You may have seen the other pieces on the site about the road.cc/Aldi team that travelled to Brands Hatch to take on revolve24 but we weren't the only ones. A team of six ladies, a mix of road.cc readers and staff paired up with Sam and Rosie from Cycle Surgery to launch a full on female attack of the circuit. With most of them having never ridden competitively before especially in an endurance relay event covering 24hrs it was a pretty daunting prospect for most of them. Add in the fact that Brands Hatch can be technical as well as requiring a bit of respect in terms of pacing due to the elevation they all did incredibly well. "I had been granted a place!! Truly scary - it meant I was going to do it! The 24 hour relay race. A really exciting opportunity - riding in a team - riding for a 24 hour period - riding around Brands Hatch! I had no idea how it was going to work out but Stu at road.cc provided lots of helpful pre-info, along with videos from Ian Upham (road.cc/Aldi) which really gave an insight into what was coming - well, a little! Popping into my head were lots of questions, what to wear, what to take, would we get sleep, how would the schedule work out, food - coffee??!! And what colour nail varnish to choose! As the ladies' team we felt it was important to follow Laura Trott's shining example, in varnish if nothing else! Relief came with the start and completing my half hour time with 3 laps. Time to refuel and rethink the strategy ready for the next stage in a few hours. Then the rain came and a change in the track conditions as a few participants discovered. Somewhat anxious for the first lap or so but I settled in and then the rain stopped! Luckily I have taken part in a few night rides but still, RACING- around BRANDS HATCH - yikes. But Cycle Surgery had arranged the loan of brilliant Exposure lights providing great night visibility. I can't believe how quickly the night disappeared - just 1.5hrs sleep followed by a very cold early morning which broke into lovely sunshine. We were on the homeward stretch, counting down to 3pm and the finish and working out strategy. Lots of flapjacks, tea, coffee and brownies later and 3pm arrived. We'd completed 138 laps between the 6 of us, finishing 61st overall, with huge smiles and a massive sense of achievement. The time just flew - even downtime between stages, chatting with other team members and teams sharing the pit garage. The event organisation was brilliant from Huw and Vicki, the other teams inspiring and I had tremendous fun driven on by adrenaline. Big thanks to everyone - participants, the marshalls who stood all night around the track, the young guys in the media centre keeping the refreshments stocked up, Cycle Surgery for arranging the team, and of course all our team for making it was it was - a fantastic experience! "I was a late addition to the team and had just eight day’s notice, not much training time at all! Arriving at Brands Hatch I eventually found my way to registration and then down to pit garage 24, which was our team's base for the duration. It was great to meet Terry, Elaine, Sam, Kelly and Fiona, and Stu plus the boys on the Road.cc/Aldi team too. Fast forward to the free practice session and first sight of the drop and then the 9% climb up to Druids. Inevitably there was a headwind and as I struggled up the climb I seriously questioned what on earth I was doing. Terry took the Le Mans style start for us with speed, elegance and grace and we settled into our planned schedule of 30 minute stints each. Equally inevitably the rain arrived and then it was my turn. The climb at Druids was less intimidating than before and I pushed as hard as I could for three laps and that became the rhythm of the next few hours. The next couple of stints were slower as the rain carried on, and I passed the sobering sight of someone being tended to by an ambulance crew, reminding everyone the track could bite back if not respected. Although I'm a year round commuter in deepest (and literally) darkest Warwickshire, I was especially anxious about the night shift but it was the best part of the event. Each lap was exhilarating! Seeing the rear lights of the other riders snaking along the track was very cool. Sleep was in short supply with the temperature plummeting as the cloud cleared and I woke up feeling cold after only an hour in the tent. The new day brought new energy and the track was absolutely gorgeous in the early morning light and I really enjoyed getting moving again. 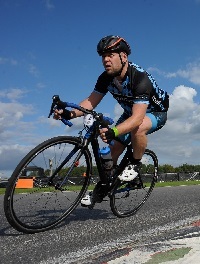 Realising the end was in sight, I gave it full gas on the last two stints, clocking up a PB by twenty seconds. I was almost sorry to finish my final session, although by that stage I'd pretty much left it all on the track and there wasn't an awful lot left in my legs. Fiona brought it all home for us to the cheers of the crowd from the pit wall, and we'd done it! Six women had taken on Revove24 and we rocked! We won the women's team category - we covered 138 laps (335 miles) and were only a quarter of a lap from Everesting. A great result for six women who had never done anything like it before. I had a fantastic time and was so grateful I got the chance to take part. "I must say I was feeling very nervous, pretty foolish and downright scared at the prospect of the next 24h after during my initial practice laps I had mechanicals on the hills down to my panic stricken gear changes. I was also doubting my ability to continue after Stu had carted a van load of my belongings all that way and felt sure I would let him and the team down badly. I’d stripped down the rear derailleur only the day before to try to get all the black gunk off my chain in an attempt to clean my bike for the event, only to realise the bits all did different things and I hadn’t a clue which went where. Luckily my local bike shop (Julian House) came to my rescue, but still it was one more thing I shouldn’t have dabbled with, for the first time, the day before such a big event! Oh, did I say I’d also upgraded my brakes, well, I did and fortunately it paid off but that first swooping bend descending from Paddock Hill had been my first time to ride downhill on them to check out my handiwork. To say my nerves were shot to pieces was an understatement and I was wondering what the hell I’d done nicknaming my bike the Yellow Peril, it’s only asking for trouble. To add to my foolishness, I’d also had a spare moment or two after setting up my tent to join the girls and paint my nails in Cycle Surgery colours plus put on some bright red matching lipstick – you’ve got to look the part after all! All this faffing around though saw me hold up both the Cycle Surgery team and the Road cc/Aldi team who had all been raring to get out there and practice, oops. It didn’t go well as half way through the second lap I found myself stood on the grass with chain perched in between the cassette and the frame. Luckily, Stu arrived rescuing me and fixed my bike. The practice laps I had done threw up so many questions about how to best change gear so as not to run into difficulties again and how to stay out of trouble on track, which side was best to keep out of the way of the seriously competitive riders, particularly in places like Graham Hill bend where a run off into the grass just seemed to be beckoning. Thankfully Stu took me out again and we managed to get in a confidence giving lap with some top tips on how to tackle the track. The race began soon to be followed by the rain and with it darkness. News soon travelled around the garages that an ambulance had been called to a crash on that very place, Graham Hill Bend. So it was with trepidation that I went out for that first lap but it turned out to be so totally awesome! Each time I went out afterwards I felt my grin getting bigger and instead of fear I was shaking with a real high from the excitement of being out there. Gradually I was using the brakes less on the descents, I was getting used to the gears and becoming quite efficient on the climbs plus by the end of the event I was pedalling downhill, hunkering down, spinning up the other side. It got to the point I was overtaking stronger riders on the climbs and catching them on the start-finish straight too – it was awesome! One of the highlights was getting to try out some Liv kit that the Cycle Surgery Team had brought along. The shorts, which at first felt a bit uncomfortable and I thought there would be no way I would be able to sit on the bike in them and that I’d try them for one shift and then I would have to change. I’m not a fan of pink either, my bike’s bright yellow and most of the time I wear yellow or green hi-viz running t-shirts on the bike but hey, I tried the short sleeve jersey too. It was great to be in the same gear as the other ladies on the team and it did give me a real feeling of belonging. My original shoe covers were soaked, so I tried out the Liv Delphin shoe covers too, they instantly made my feet look like little rockets and the reflective detail looked pretty cool too. So, I wore this gear out on the bike, first in the dark, teamed with gilet and arm warmers, but actually found it exceedingly comfortable plus the shorts being proper shorts rather than bibs made all those trips to the loo so much easier than they would’ve been otherwise. As the sun came up my confidence soared, I spent a lot of time looking down at those shorts, which incidentally turned out to be very comfortable once they’d been broken in, I thrived on the image of my legs looking tanned and powerful against the comfortable stripped banding and the shoe covers added to that image, glinting in the sun. I was doubtful that I’d be able to wear that jersey as the sun grew hotter, I’m not nicknamed Miss Lycra for nothing and have quite a reputation for having to strip down to a crop top when I run but I was pleasantly surprised how cool the jersey kept me and I though it looked great, so it’s changed my mind on pink! I think we looked like a team of champions when we climbed up on the winner’s wagon to receive our prizes of Champagne and Mud Off goodies. I am so grateful for the chance to take part in this event. For a relative beginner like me the chance to practice my skills in a traffic free (by that I mean cars) environment, where I could focus solely on riding was incredible. My team were amazing too, I had been so worried about having enough time to complete three laps on my final stint before the event finish, but with one turn left each they all pulled out the stops and created ample margin for me not only to complete a third lap without undue pressure or stress but they’d worked so hard they’d made a big enough window, through their combined efforts to allow me to complete a fourth lap, taking my total laps to 25, which was an almighty privilege to be able to do. The whole experience has been amazing, it’s pushed my boundaries and my riding beyond what I could have ever thought possible and I’ve come out a stronger rider. I loved it & would do it all again tomorrow!" "The track was smooth yet lumpy - the hills were a challenge for me - but the downhills a buzz - each time I saw the Pirelli bridge come into view I felt proud. I was determined to do my best for my team mates as they were awesome, in ability and support and I saw only smiling faces form start to finish. Given we'd never met until the morning of the event, this was in itself an inspiration. Liv and Gore took care of us with quality fitting, un-hindering clothing - it made it much simpler. Liv gear fitted all of us, us of every shape and size perfectly, loved by all. My Gore pants first adorned at 5.40 am, after a cold one hour sleep, enabled me to get back on my bike for the 6.00 am session, two minutes earlier it nearly didn't happen. Throughout the event we had every weather type bar snow, but even if we had Cycle Surgery Women's team would have rocked it, and the cheery support from our garage mates and the organisers Huw and Vicki Bunn helped make it happen. An incredible 24 hours, I’m still on a high from it as I sit here drinking my mint tea from my Revolve24 mug. What's a mph? Is that the noise you make when you go over an unexpected speed bump? Well done ladies. No team Everest? You'll just have to go back and try harder. Cup of tea, duck? It's a brilliant effort by all concerned, and without wanting to be picky about the writing on road.cc (I'm at risk of sounding like a moaner), wasn't the use of the word 'ladies' to describe women's sport assigned to the dustbin of sexist anachronisms around 30 years ago? Surely a team of bright young writers can see that this is *so* last century? I was watching the Olympic BMX finals on the iplayer (last chance, gone now) and the final was called something like 'Finale Feministas' and the Mens 'Finale Masuculas.' Appropriate? wasn't the use of the word 'ladies' to describe women's sport assigned to the dustbin of sexist anachronisms around 30 years ago? Surely a team of bright young writers can see that this is *so* last century? At the risk of sounding sexist, genuine query. Is the informal term 'ladies' not the said thing anymore? I can't see the undertone with 'ladies' in context here. Surely the alternatives are equal in connotation?